Tires are a unique and vital part of every vehicle: they are the physical connection to the asphalt, dirt, snow and whatever else the road can throw at you. Still, many of us enter our vehicles every day without considering how much actually rests on our tires. Keep the safety of you and your passengers in mind– follow Park Muffler’s guide below to ensure your tires remain in peak condition for as long as possible. 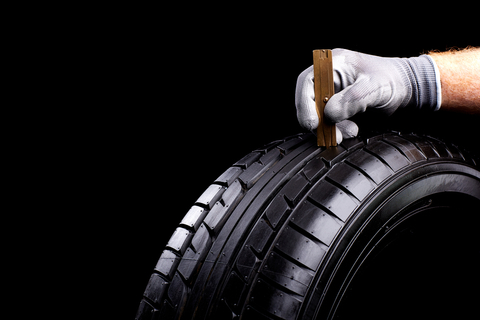 The easiest and potentially most valuable thing you can do for your tires is… look at them! Before starting your vehicle, visually inspect each tire for any new damage, deflation or defect. If caught early enough, many small tire issues can be reversed or repaired before they become any more serious (and expensive). **Note: Tire inflation can lower over time unevenly in different tires, increasing wear and tear. A pressure gauge can help keep this problem in check. Toonie. Place a two dollar coin between your tires’ treads and use the following as a rough guide: if the tread reaches the gold, very little wear; tread only covers silver, half worn; tread doesn’t totally cover the letters, it may be time to replace. Wear indicators. Manufacturers may include small numbers or nubs along their tires. Known as tire tread wear indicators, they are meant to indicate tire replacement when they have all worn off. Depth gauge. A pocket-size tool that is cheap and simple enough to keep in any glove box, a tire tread depth gauge will give you an exact measurement of how much tread is left on your vehicle’s tires. By consistently monitoring your habits and your vehicle’s responses, you can unlock another way to identify tire issues on your own. For example: poor fuel efficiency can be an indicator of excessive or uneven tire wear. Additionally, if your vehicle pulls to one side or another it could also be due to problems with your tires. As you can see, you can observe your tires even while you are driving. Are you concerned about your tires, but unsure if they need repair or replacement? Contact or visit Park Muffler today! Our friendly, professional technicians will ensure your vehicle is safe and reliable where the rubber meets the road.